The yogurt was a bit past its due date, so I knew it was a risk when I popped the lid open. I steeled myself in case it was gross. It wouldn’t be the first time that I witnessed nature at work. Sometimes there is that gray fuzzy green growth. The fuzzy gets my attention. It makes me squirm, a little. It was the organic full fat yogurt and about six or seven days past the end of its prime. I guess I could just toss it out and save myself the gross-out. I feel compelled, though, to recycle the plastic container. And you’re supposed to rinse containers before you put them in the recycling bin. We’re really good about recycling at our house, so percentage-wise I’d be within the margin of error if I tossed the plastic yogurt container in the trash. I just don’t. I braced myself for the surprise that waited inside and opened the lid. And, surprised I was. 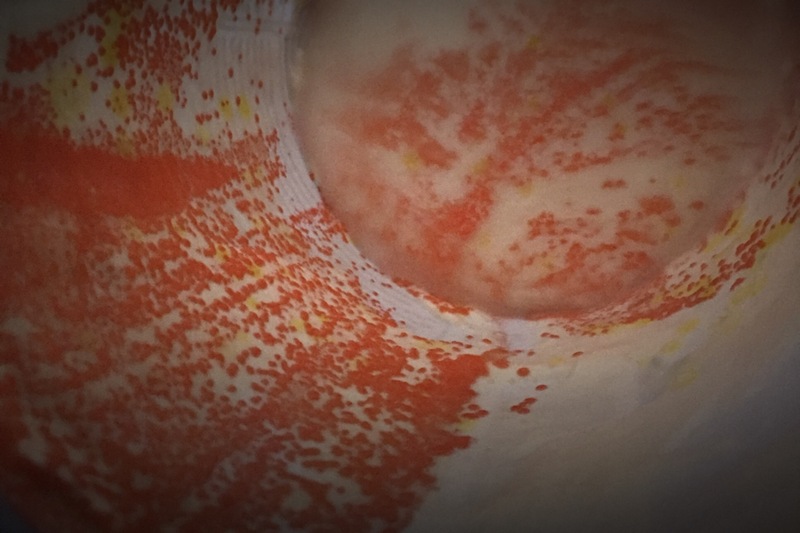 There were small neon orange polka dots spattered in a striped pattern down the side of the container and swirling in the remaining yogurt on the bottom. It actually was beautiful. Not edible, but beautiful. The dots–the less pleasant name for the dots is “mold”–floated on the wall of the container so it very easily was rinsed off and washed down the drain. I’m glad I opened the tub. So beautiful. So gross.